5 reasons why your new website will be even better than you had expected! Congratulations! After ample research you have selected an agency who will design and develop your new website for you. You may now lean back, let them do their work and your fantastic new website will be ready soon, and undoubtedly a guaranteed success! What a time to be alive. After years of experience designing and developing websites in Hong Kong, we know that while an agency plays a significant role in the results of a web project, you as a client are just as empowered to greatly improve the result. To help you out we’ve outlined this checklist of five rules that will make you an awesome client to work for — because awesome clients get awesome projects! Good designers are problem solvers. Together with your agency, set realistic goals for your project so you can benchmark (difficult) decisions against them. Designing without a goal is like running a marathon without a finish line: a lot of effort is put in, but nothing ever gets finished. Setting clear goals will help the project managers gauge if the project is successful. And if you set “converting more paying customers” as the primary goal of your site, the resulting design will be quite different from a site where the main goal is “strengthening online presence position”. Great and realistic goals are formulated in S.M.A.R.T. format and move your organisation forward. The sketch and final custom product filter Grayscale designed for Nauticam. Our client Nauticam wanted to reduce the time they spent answering questions about which products were compatible. We agreed to define that as our goal, and designed a product compiler which greatly reduced the number of technical inquiries, driving their site visitors straight to their retailers. A good agency will have some form of a standardised process or steps in which they do things. This methodology can be waterfall, agile, SCRUM or another method. They may be flexible to meet your needs, but make sure that you have communicated your expectations clearly when selecting and choosing your agency. Let’s say you need a new logo production ready within two weeks and your agency usually takes two months for this, finding a compromise will be difficult and can lead to unsatisfying results — from both parties. Although your agency will do most of the work, if they ask for something (like content), they still need time to insert it into the website. Double-check with them when things are expected from you, and make sure you have resources available to do them. This helps moving the project forward and therefore meeting deadlines (which works both ways!). 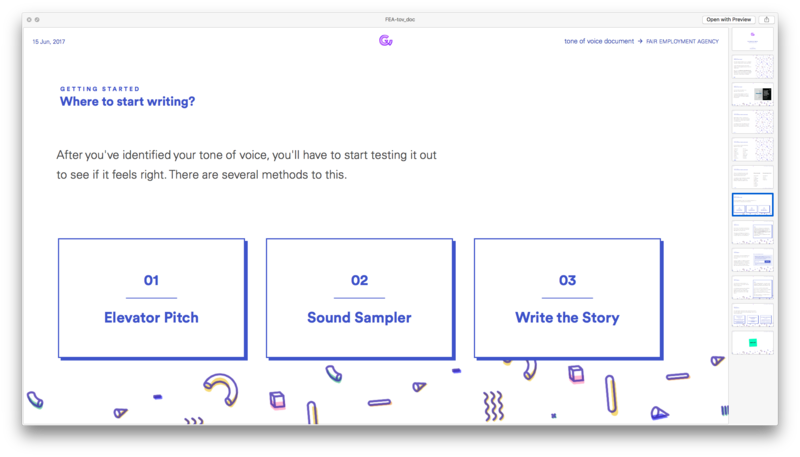 Grayscale wrote a Tone of Voice document for Fair Employment Agency so that their messaging would sound sincere. Creating content always takes time. Emily at Fair Agency worked hard to create good copywriting which conveyed their message and was aligned with the visual style of the site we designed. Our Tone of Voice document helped them find their narrative. Besides having solid processes in place, any agency worth their salt performs research on your business, industry, challenges and users before wondering how your site should look like. However, you’ll undoubtedly know a great deal more about all those things than your agency does. Therefore don’t be afraid to give honest and clear feedback if they don’t seem to understand something, or come up with solutions which simply wouldn’t work. The right agency shouldn’t be smitten with their own designs. Instead, they develop an insatiable curiosity about the problem. Your timing of the feedback matters. Comment often and early in the process, when it is easier to make changes without losing precious time (see 1 Hour of research saves 10 hours of development). EFT-CRAFT’s hero animation had to be technically correct, so it required some back-and-forth between our designer and an engineer. EFT-CRAFT‘s project manager was intensely involved in the design process and gave constructive, on-point feedback early and often, that supported the purpose of the site (see step 1: set clear goals). This made sure their website project ran very smoothly and there were no ‘unpleasant’ surprises late in the process. 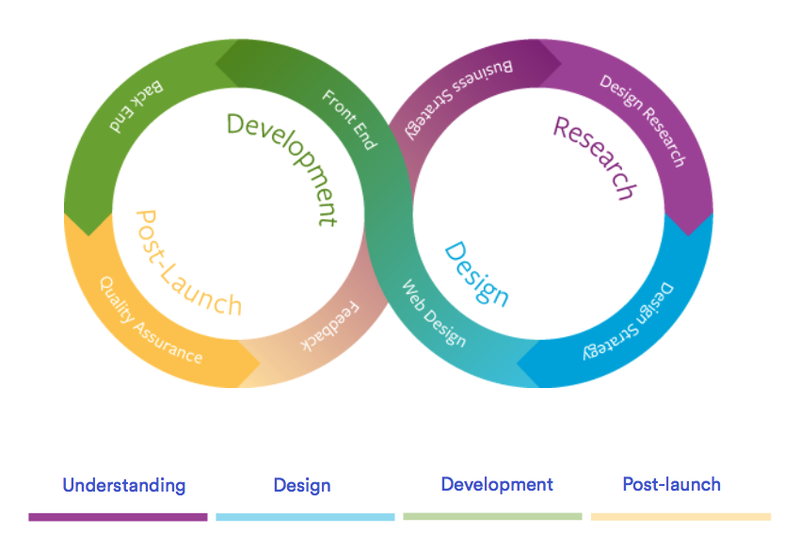 Even though a great design proposal (whether that is a fresh corporate identity or a new website) has many benefits for an organisation, it’s not going to solve all your problems at once. A designer might be spending months on end figuring out an amazing user interface for your ecommerce website, but if there is no demand for your products, the website isn’t going to magically generate that demand. Driving traffic via SEO (search engine optimisation) may help, but only up to a point. Put the bar high for your design agency but don’t expect them to perform miracles by solving problems that aren’t theirs to solve. Set achievable goals together and keep communicating about progress in order to produce a successful web experience. DanBot is down, but not out. 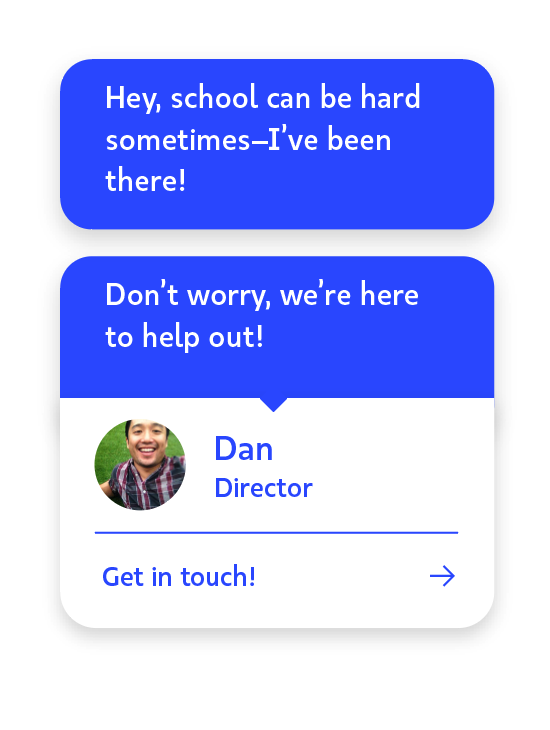 During a design workshop with Aegis Advisors, we concocted the notion of a personal tutor assistant that journeys through the site alongside the visitor, which we lovingly dubbed DanBot (after one of the founders). The actual functionality of DanBot had to be stripped back when it didn’t prove feasible to script it with conversations, but together with the client we arrived at a realistic solution without compromising too much on the actual result the DanBot would provide: personalised hand-holding through an on-boarding process. The last but not the least important rule. Some say “nice guys don’t get laid”; well, we think nice clients do get paid (in little extras). All clients get value for money, but in fixed price projects there are always grey areas. Agencies are generally more rewarding and lenient in form of free time and effort to clients who deserve this treatment. Consider the following. Agencies and freelancers often work for more than one client at the time, and there are only 24 hours in a day. So priorities have to be set. Especially if contracts are fixed price, the imperative to spend more time and effort on a project is not purely commercial. The vendor is most certainly going to be more generous with their effort and time towards the client who understands that extra work is not always free, asks for a favour instead of demanding it and is truly appreciative of the quality of work. Conversely, the one client who pushes hard to get work done well before deadlines, sends shouty emails in red capital letters, is always late paying their invoices and never says thank you might retroactively get down-shifted in attendance, courtesy and priority. Getting paid for our work is just part of the job, but being genuinely appreciative and courteous will make us go beyond the moon to deliver you amazing results that’ll knock your socks off. Rachel Austen (Austen Advisory) sets an example for many of our great clients. Positive, understanding and greatly appreciative, whilst remaining critical of her project’s quality and keeping everything in line in terms of timing and budget. Together, we converted a business idea into a system of a world leading product to evaluate employee stress and burnout. And we loved working on it, because working with Rachel was such a rewarding task. Now you know what it takes to be an awesome client, and you’re ready to go make an awesome identity and/or website. Please get in touch with us to find out how we can do that together! After working as a Marketing Consultant, Teacher, School Manager and freelance Sports Marketeer, Jarijn moved to Hong Kong. Here he uses his (digital) marketing and people skills to provide the best solution to Grayscale's clients. In his spare time he spends a lot of time on sports like beach volleyball and swimming.